To determine what the best beginner and kids drum sets are, you must first understand what that entails. When we talk about a beginners drum set we talk about a regular five-piece set. Five-piece sets include toms, snare, bass, cymbals and a hi-hat. In reality you will have three toms, a snare, a ride/crash, a bass drum and a hi-hat. That’s all you need as a beginner, you can always add a China Splash or anything else. If you choose a good beginner base drum set you can always replace and build from that base beginner set. So don’t be afraid to spend a little more cash than you had in mind. Below you will find our top seven picks for best drum sets for beginners. The Alesis DM6 USB Kit is a customer favorite in many music stores and online shops. This is probably due to its low price and high quality. We’ll go over the Alesis DM6 its features, pros and cons and tell you our final grade. The Alesis DM6 is in the list because this is an excellent starter drum set, and it’s electronic and some people prefer electronic sets over acoustic sets. 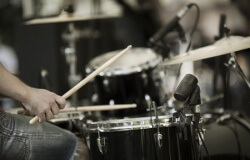 There are several benefits that come with an electronic drum kit. For starters, you are able to play with headphones so no one will hear you, and second you’ll be able to change the sound with just a few simple clicks. 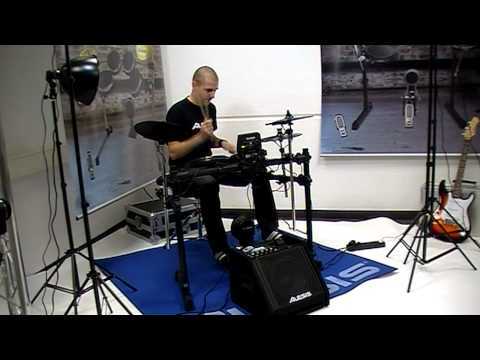 The Alesis DM6 USB Kit is a five-piece electronic drum set. It includes a kick, 3 toms, snare, 2 cymbals a hi-hat pad, kick pedal and the drum controller/computer. The kit is all black, except for the chrome in the kick pad and cymbal bars. The kit is made out of lightweight material and can be shipped worldwide without any problems. Let’s take a look at the snare and toms. They snares are 8-Inch, dual-zone snare pads made out of rubber and a lightweight aluminum casing. While the feel of the snare and toms is great, it is not quite able to duplicate the exact feel of a drum head (but it’s pretty close). To learn more about this amazing drum kit, please read this article. 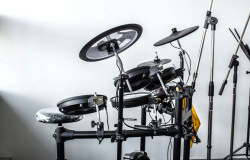 The electronic drum kit has great features for its low price, but this doesn’t mean that it’s the best set out there. However, the kit is certainly one of the better ones. As for the negative side of this set, materials are an issue. Because the snare drum and the toms are made out of rubber, the heads dot feel the same as a real drum kit. 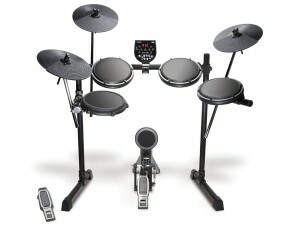 That said, Alesis has done a great job in creating an electronic drum kit that mimics the feel of a real drum kit. So don’t worry too much about the rubber. For the pros we’ll go over the features of this kit, they are truly phenomenal. The DM6 Module is equipped with an AUX, and USB-MIDI port for play along and transmission. The module has a total of 108 drum sounds and 15 programmable drum sets/profiles. These are amazing features when you consider the price. 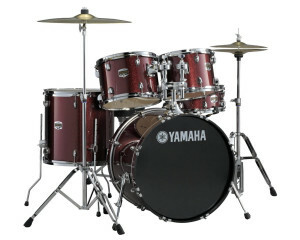 The Yamaha Gigmaker is a 5-piece drum set for starters with a standard shell pack, a 22” Bass drum and a Burgundy Glitter finish. It’s a perfect set for a beginner, as the sound the kit produces is better than the average beginner’s kit. 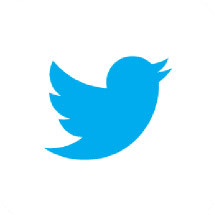 Yamaha is known for producing only high quality musical instruments. We’ll go over the kit’s specifications, and the pros and cons below. This amazing Yamaha 5-piece drum kit is an excellent choice for any beginner. The set includes 3 toms, a snare, a hi-hat, a ride/crash and a bass drum. All a beginner needs is included with this set. The sound of the set is amazing! For a beginner set in the low range price class this is definitely a set worth every penny. The Yamaha Gigmaker is available in several sizes and multiple colors. While our favorite is Burgundy Glitter, there are many different colors available. The bass drum is available in either 16” x 20” or 16” x 22”, the snare has a standard size of 14” x 5.5”. 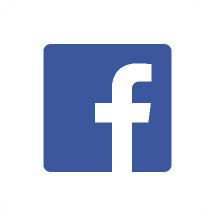 For the tom sizes you can choose the following: Floor tom 16”x 16” or 14”x 14”, mounted tom 13”x 9.5” or 12”x 9”. The smallest mounted tom is only available in 10”x 8”. The cymbals provided with this set (ride and hi-hat) are Paiste 101’s. The only con we could think of is the fact that the color options are limited and they are all glittery. Depending on your taste this might be an issue. However, we think that this set is one of the best options for beginners. If you’re able to keep an acoustic drum kit at home, definitely take a look at the Yamaha Gigmaker. Another great thing about this set is that it comes with matching wood bass drum hoops for superior tone and playability. Most of the kits in this price range do not have this. Furthermore, Yamaha’s tom mount system is phenomenal, really adjustable, and easy in use. 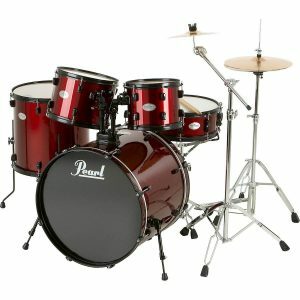 Another great beginner’s option is the Sound Check 5-piece drum set by Pearl. Pearl is one of the best manufacturers of drum kits and high quality is guaranteed when you decide to buy a Pearl drum set. Just like the Yamaha Gigmaker, the quality of this kit is above average when compared to others in the same price class. 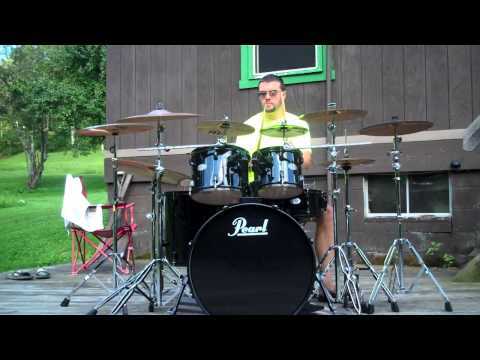 This entry level drum kit is perfect for any beginner. The Pearl Sound Check is a 5-piece drum set that comes with Zildjian cymbals. Upon releasing this set Pearl said that this was going to change the mind-set of what an entry-level drum kit should be. And they’ve done a good job! 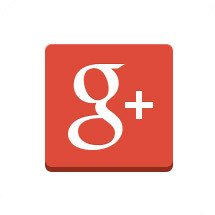 Many manufacturers have followed their lead and released better beginner drum set. The Sound Check drum set is available in red or black. The set includes 3 toms, a snare, 1 crash, bass drum and a snare drum + hi-hat. The hardware that is provided with this set is of amazing quality and it will last years. The bass drum is a 22” x 16” kick drum. The tums come in the sizes 10” x 9” and 12” x 10”. The 14” x 5½” wooden snare produces top notch sound. The set comes with 13” hi-hats and an 18” ride (+ free 14” cymbals). If you are looking for a high quality beginners drum set the Pearl Sound Check is a set you should take in consideration. The biggest pro of this set is the high quality Zildjian cymbals that sound and feel amazing. The quality of the set is very high compared to other beginners set in the same price range. The only negative we could think of is that there are only 2 colors available. Apart from that this minor flaw, we think this is a superb beginner’s drum set. 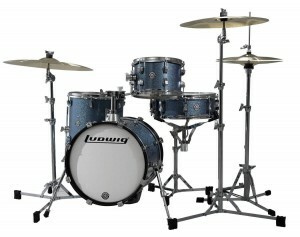 For the money, the Breakbeats Kit by Ludwig is one of the best beginner models available. Designed for smaller dwelling or gig sites, Backbeats allows Junior to play at home or take his budding talent on the road. The Backbeats Kit features a 16″ x 14″ bass drum, a 10” x 7” tom, a 13″ x 13″ floor tom, and a nifty 14″ x 5″ snare. Crafted of 7-ply poplar, the kit is relatively light but its drums still produce a dry and tight sound. Featuring triple-flanged hoops, the snare and toms can take a beating when the young percussionist is showing off his toughest rim shot. Easily assembled and disassembled, Breakbeats can be quickly stowed after a rehearsal or performance. Velvet bags are provides with this kit, allowing for easy transport or dust-free storage. Many performers also use the bags as a sound break or to produce a muffled finished. Customizable in a variety of finishes, Backbeats can also be crafted to match Junior’s desired color scheme. On this particular unit, cymbals are not included in the standard kit. The pros of this kit are numerous. First of all, the price point, typically under $500, makes the kit highly accessible to the novice. The kit’s compact design and fairly easy portability also make this a favorite of the beginner percussionist interested in displaying his/her emerging skills. With a rugged hooped design, the kit also can take the beating often rendered by the beginner. As for cons, the kits poplar construction can be a detriment if one is use to the heavy hickory or maple construction of high-end instruments. The kits lack of cymbals also entails an additional purchase if someone wishes to complete the kit. 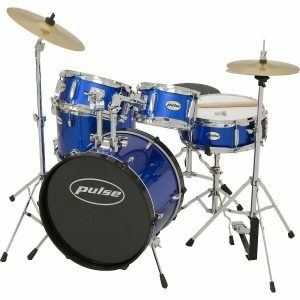 The Pulse 5-piece Junior Drum Set is a real drum kit that was designed with the little drummer in mind. Featuring real wood shells, the smaller-than-standard drum sizes include a 16″ x 12″ bass drum, 8″ x 5″ and 10″ x 6″ mounted toms, 13″ x 10″ floor tom, and a 12″ x 4″ snare. It also comes with the accessories that all percussionists prefer including a kick pedal, high-hat stands, and room for growth. Did I mention that the “metal” is standard with the kit too? This set features a 12″ cymbal along with two 10″ hi-hats. On the positive side of the ledger, the Pulse 5 comes with a lot of standard features at a good price. Sized for younger players, the 5 will not overwhelm the novice’s arm and leg reach. Available in 11 factory finishes, the Pulse 5 will add colorful flare to the performer’s room or studio. On the downside, some Pulse owners report that the instrument degrades relatively quickly. As the novice’s skills deepen, the Pulse may physically succumb to an expanded rudiment repertoire. While Hunington is a lesser-known variant on the market, they do offer some excellent options for the newcomer to the percussive arts. The Huntington DRM500-BK is marketed at 5-piece set that comes equipped for the beginner poised to take the next step in the percussive arts. Designed for larger kids and teens, and is built with a host of standard features and also has room for ample expandability. With anodized hoops and hardware, this model resists corrosion and other waterborne maladies. Built with 8-ply poplar, the set is much lighter than the big boys allowing for easy movement. 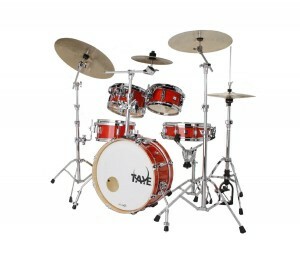 The five-piece set includes a large 22-inch kick drum as well as two tom drums. You also get access to an impressive floor tom and a matching snare that measures 14 inches. Other accessories include a drumsticks, drum key as well as cymbal and snare stands. The stands are double-braced for added strength and security. The pros of the Huntington DRM500-BK include affordability and expandability. If you bring a DRM500-BK home to your young percussionist. On the con side of the ledger, the Huntington DRM500-BK can degrade relatively quickly if junior puts the kit through a robust workout every day. Taye Galactic GAD518F helps beginners build valuable drumming skills quicker through a collection of outstanding features including poplar shells that are as well as highly touted EFS shell technology and Side Latch snare release. Worried about how to mount your drums? You don’t have to be with these drums. The Galactic GAD518F comes with Taye’s PocketHinge mounting bracket technology that allows your drums to be mounted for easy access during play, without any problems. This drum also includes counter hoops and black-colored lugs that augment the performance of the four high-end laminate finishes. The Galactic kit gives you complete control over the kind of sounds you are able to play through a range of configurations such as brass cymbals, drum thrones, and more. We like the Galactic’s versatility. The PokcetHinge feature, especially allows for expandability without massive space compromises. Highly configurable based on the percussionist’s playing style, the Galactic is good for rock and jazz artists. Perhaps the one con to consider here in the poplar construction. Yes, the poplar allows for maneuverability, but it tends to dent and ding over time. 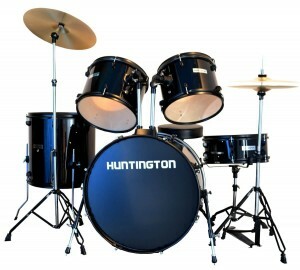 Beginning drummers do not need a very expensive 10-piece drum set with special recording equipment and a drum screen. No, a beginner needs a solid 5-piece drum set that will last for a couple of years. The sets reviewed in this article are good options for every beginner. If you are concerned about the noise you’ll produce, you might want to take a look at the Alesis DM6 or another electronic option. Auxiliary Percussion Must Haves 2018!